When Harry Met Sally star cast, Meg Ryan, Billy Crystal, and Rob Reiner Reunite after the release of 30 years at the anniversary event. 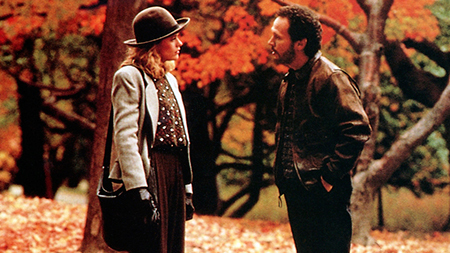 Harry Met Sally turned 30 this year and still it was one of the most beloved romantic comedies of all time. The star cast, Meg Ryan, Billy Crystal, and Rob Reiner all came together for a reunion in honor of the film’s anniversary. The lead pair arrived in matching black outfits and took to the red carpet together at the TCL Chinese Theatre in Hollywood on Thursday. Meg Ryan and Billy Crystal twinning at black. The movie was released in 1989 which grossed $90 million at the U.S. box office against the budget of $16 million. The film received five Golden Globe nominations along with one Oscar nomination. “I think that there are some basic truths about men and women that people connect with, and those kind of things, that dance, that weird dance that men and women do with one another kind of is basic and kind of there all of the time." Sally aka Ryan also sweetly noted that her chemistry with Billy made the movie more special which help audiences to connect with their characters. Meg Ryan and Billy Crystal from the movie, When Harry Met Sally. The 10th annual Turner Classic Movies Festival is held from April 11 to April 14 in Los Angeles.